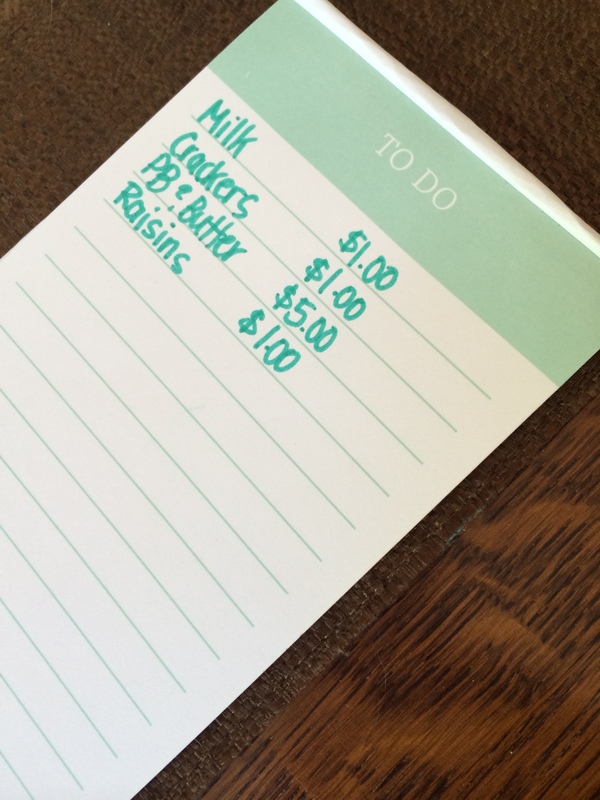 If you missed it, I’ve already lamented about my lack of organization with learning targets. When I started to rethink this whole learning target thing, I knew that teaching in isolation was no longer going to work. This happened to be the same year that we had a new teacher join our six person team. Her joining this team started a transformation, we realized that we should be planning together, and even though our learning targets might be the same, we’d still have our own spin on how we taught it. So we started with math, because math learning targets seemed manageable. We also started with our text as a resource. We already had a curriculum/pacing guide set up, but it happened to align with the textbook, and it had been written almost a decade ago. So we looked at both learning targets, and the pacing of our content at the same time. It was not easy, but it was some of the best math conversation I’ve ever had with other staff members. We transformed our learning targets little by little. We did the first unit together, then we split up and trusted one another to do future units. It was amazing. Our learning targets went from complicated and confusing, to clear and concise. Most importantly, they became student friendly. We took the long and wordy objective from the book, and converted it to what the student must absolutely be able to do. What was listed in the book was wordy, long and full of teacher noise. In this case, this is a HUGE objective, writing and reading numbers that are both 3 and 4 digits, especially when written in various ways (standard form, word form and expanded form). We asked ourselves 2 questions to narrow it down. What does the student need to be able to DO as the END goal? Students will read and write 3-digit and 4-digit numbers using place value understanding. Students will use expanded, standard, and word form when working with numbers. I can read and write numbers up to 1,000. I can read and write numbers up to 10,000. I will not lie, the process was a little hairy to start. Many of us struggled with the rest of the objective…why aren’t the various forms of numbers included in the target? Why don’t we use the words place value in the new targets? We came to the realization that all of THAT comes into play during your instruction. Students find out those words as you play with and explore the numbers. In addition, teachers give them success criteria so that they know what it means to read and write numbers up to 1,000. 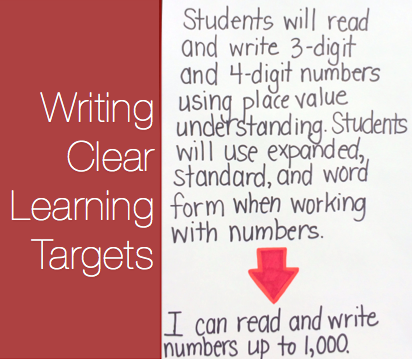 Once we had that understanding, it became easier and easier to write clear learning targets. Stay tuned for more on success criteria in my next post. Whose Targets Are They Anyway? When I first started teaching I never, and I mean NEVER wrote objectives, outcomes, learning targets or ANYTHING on the board for my students during a math lesson. When I finally started writing learning targets, they were about 3 sentences long, and I could barely understand my own learning targets. I used to work in total isolation. I had a 6 person grade level team, and so we all wrote our own plans, never consulting one another or even thinking about planning together. It just wasn’t what we did. We all had different learning targets! I got to see Dr. Robert Marzano speak, and it totally opened my eyes to many of my mistakes, that could be corrected in small ways. 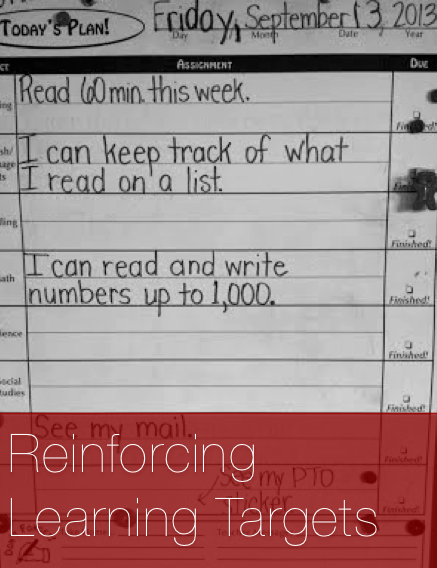 I realized I was losing my students with my wordy and often adult-like learning targets. A new teacher was added to my team, and began to ask us to plan together. So I had to change, BIG TIME. Not just add a new bulletin board in my room with a cool border, I had to change my belief system to the core. You see, before this epiphany I knew my students loved me. I created fun experiences and I had high energy and we got a lot done. But deep down they weren’t learning at the highest level, because I wasn’t making their learning clear enough to them. They were achieving things and learning, but I knew if I could work through this, ALL of my students (including those struggling) could achieve more. I started to rethink this whole learning target thing, and realized that I needed to really clean up my act. I rethought the teaching in isolation thing. So I worked with my team to develop common, kid friendly, math and reading learning targets. I knew that just creating them wasn’t going to be enough, I had to actually make them visible for each lesson, have the students interact with them, I had to communicate them to parents, and I had to assess them. This sound like a lot of work! I knew I could do it in small steps. Here is the first small step I committed to, which made me a better teacher. I committed to writing my learning targets for both math and reading on the student planner. The students copied them on the planner (Oh, they were angry with me at first, third graders do NOT like to write) every day. I can statements, word for word, copied in their planners. They copied them word for word, and their parents had to sign the planner each night. I made this a strict routine. I knew the students were ornery, and I didn’t care. If I put the learning on the planner in the morning, it meant I would commit to my day and remain organized in my teaching. It also meant that the target would be reinforced again when they wrote it at the end of the day, and then once more as they talked over the day with their parents. It turned out to be one of the best things I ever did. After a month of grumbling, it just became part of US, our classroom community. We were learners! Instead of being some meaningless target on the easel, they began to take ownership of their learning. I’ll continue to highlight some of the other things I did with my learning targets in future blog posts. Stay tuned as I share the tiniest tweaks, and how they made a big impact. Today was a totally delightful 20 minutes of math play. It ended up being almost 40 minutes as we created our play situation. Our menu, cash and the ordering pad for the server. Right away she wanted to order a Hawaiian Punch juice box, and an appetizer of crackers. That was when I asked her how much money she had. She counted her cash, “I have 8 dollars.” I asked her if she had enough money to buy a lunch. This was one of those moments where I wish she would think out loud, because she immediately changed her drink order for milk. I bet all kinds of good mathematical thinking was going on there! Now, if I know my daughter, it’s because she wanted enough money for dessert! 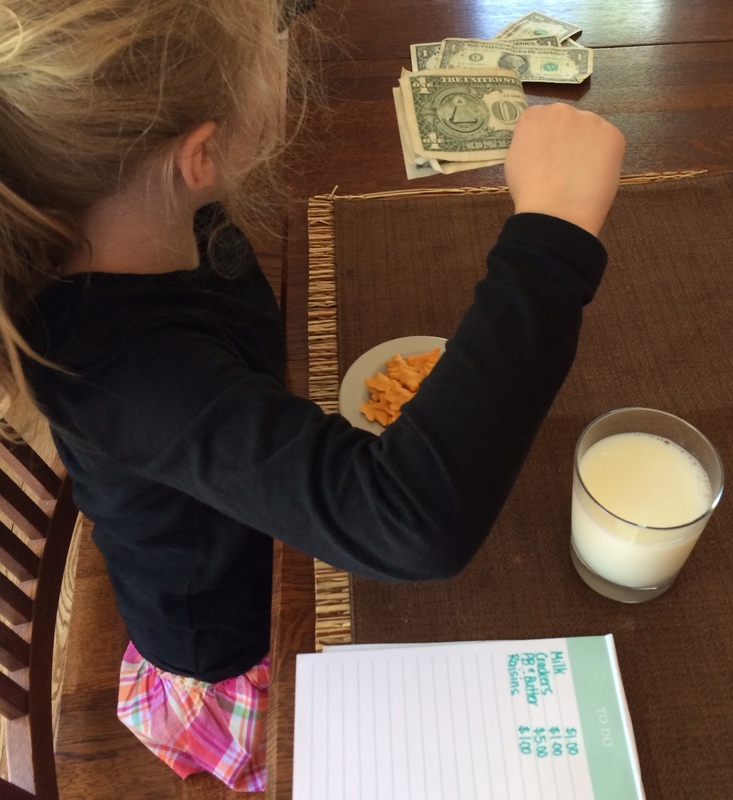 Here she is counting her money after ordering her milk and crackers, to be sure she would have enough. She quickly realized that she was NOT going to have enough money for dessert, so she sprinted off to go and get her piggy bank, coming back with coins. She asked me so innocently, “How many of these do I need for a dollar… one?” That was the perfect moment to tell her that a dollar is ten dimes, or four quarters…the perfect intro as to why she needs to know about coins and their values. Which will lead to many more fun money play sessions! 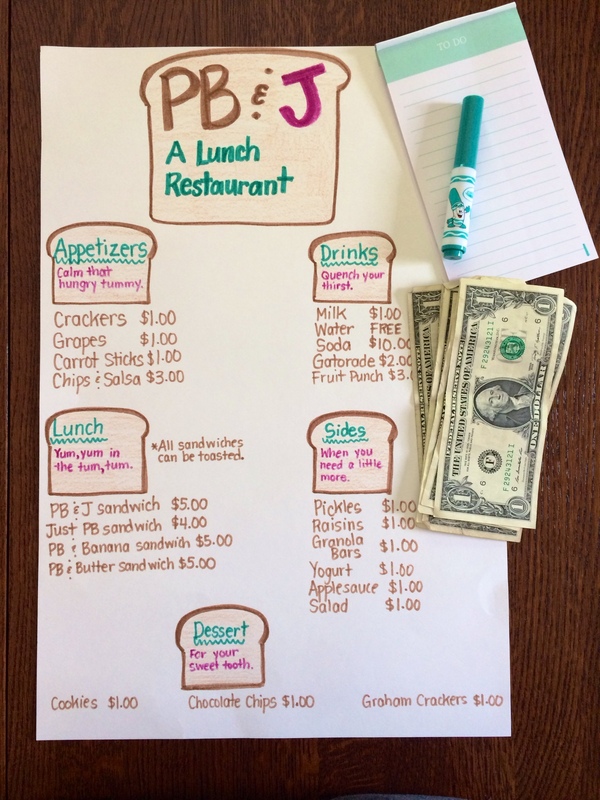 We can use this same menu, but change up the ways to pay, the amounts and combinations of money. All of which she will have a strong reason to want to know how to do it. I’ll take that tip over 20% any day! I love when math becomes a natural part of our lives. 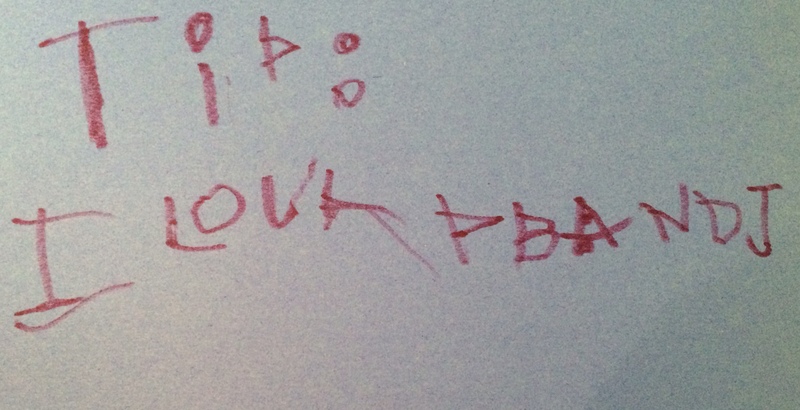 When my five year old mastered counting to 20, we began counting by two for fun. Now we count by two all the time, it is faster and she gets to see and hear herself say even numbers. We always make sure to pair up whatever we are counting. 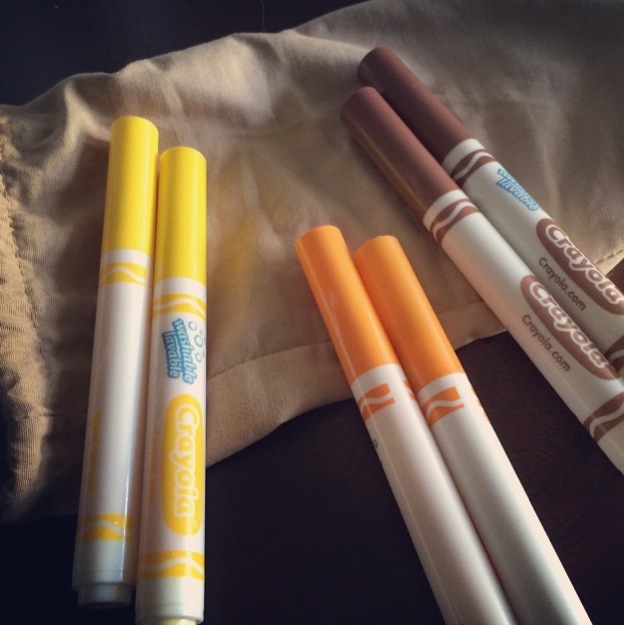 For example, this morning as we were coloring she paired up some of her colors. When I asked her how many she had, she answered “Six!” without even thinking about it. She is now at the point where seeing three pairs means six without having to count it up. That intentional practice sprinkled throughout the day leads to great number sense in the long run. We never sit there and recite it, we do it authentically when we have a lot of things to count up. Maybe next we’ll start to tackle groups of three. Skip counting is so fun!